Keep a rudy eye open mates because there be squalls ahead and Davy Jones waiting for them. Be off with ya! 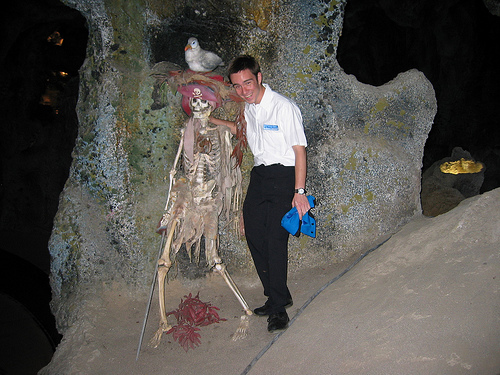 This collection of photos was taken by Disneyland Cast Members in the Pirates of the Caribbean backstage. This post is the second in a series themed “Disney Never Wanted You to See Disneyland This Way.” So far we have just covered the Haunted Mansion and Pirates of the Caribbean, but if you continue to share and like the articles, we will keep posting more photos. 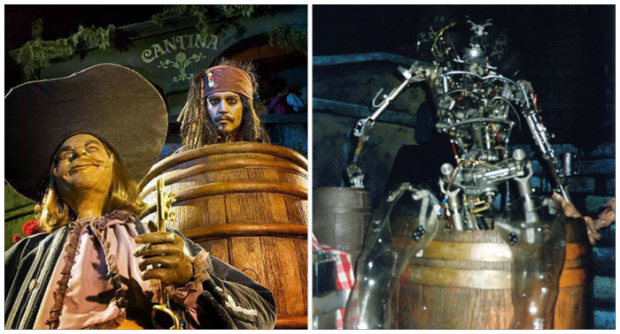 Disney uses Audio-Animatronics throughout their most classic attractions to present the stories, whether it be in a spooky old house or deep in the heart of the Caribbean. 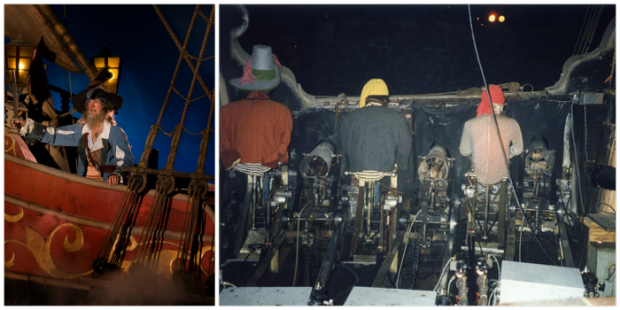 In these photos, you have the rare chance to see the inner-workings of the Audio-Animatronics and backstage in one of Disney’s most classic attractions, Pirates of the Caribbean. The boats have a special room of their own. They have changed these scenes since these photos were taken. More cameras and monitors than Fort Knox. In every attraction that uses individual ride cars (any attraction that doesn’t use the Haunted Mansion Omnimover system) has a route that connects two areas of the ride. 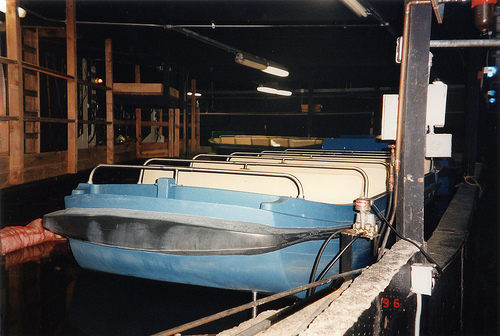 The cars or boats that aren’t being used in the ride are stored in this area. When the line begins to get long, or Disney wants to increase the capacity they will pull in more boats from this area and when they decrease the capacity, boats are pulled into the front end of this bypass. On the left is how the animatronic appears when you are riding the attraction, and on the right is the way that it is seen from backstage. Note the mechanics that cause the pirates to pop their heads above the gunnel of the boat and the cannons to function. It’s amazing the difference between what the guest sees on the attraction, and what the rest of the animatronic looks like. What you see on the right is the inner workings of the fat pirate that is sitting on the barrel in front of Captain Jack Sparrow. 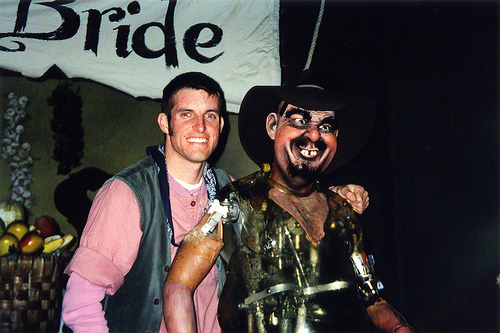 All of the animatronics have three costumes that are routinely switched out for repairs. With all of the repetitive moments that each character goes through, the costumes are constantly enduring wear and tears. It is common in certain places like joints or wrists of the characters. The pirate below is waiting to be dressed in his new costume while the one he was wearing was taken off for repairs. The security system has been much improved since this photo was taken. 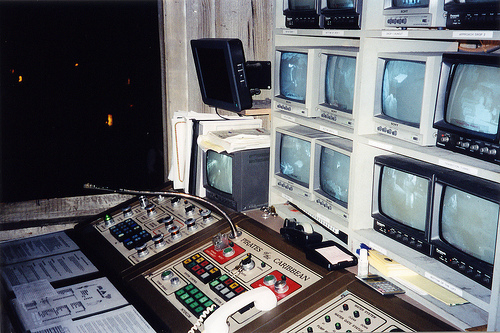 A Cast Member sits in this control room to monitor all parts of the attraction. 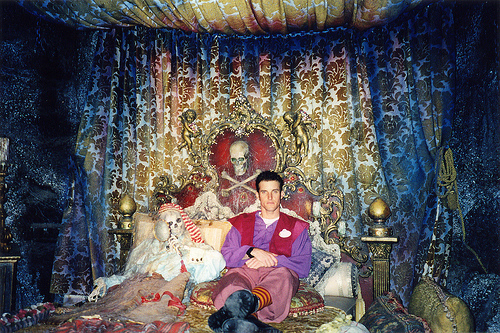 In the past, guests have been caught jumping ship in the treasure room attempting to fill their pockets with “gold.” These escaping guests often have had a little bit to drink and are escorted off of Disneyland property if the situation suggests it. Spider webs and dust are added to the Pirates of the Caribbean attraction during the major refurbishments to keep everything looking as old as possible. It looks brand spanking old! The backstage photos come from this gallery. All other photos are copyright Disney. 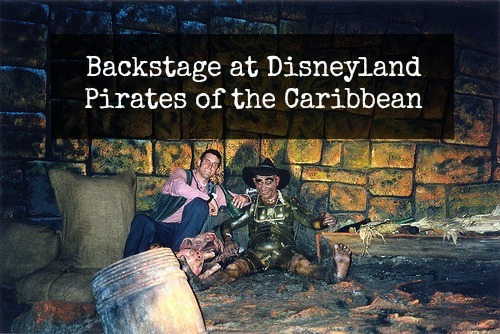 The Pirates of the Caribbean is the last attraction that Walt Disney ever worked on at Disneyland. He passed away months before it’s completion. Some say that it was the best attraction to ever be built by the Walt Disney Imagineers. Perhaps that’s why more than 300 million people have enjoyed the attraction since it opened in 1967. If you are interested in learning more about the attraction I highly recommend the Jason Surrell book, Pirates of the Caribbean: From the Magic Kingdom to the Movies . Be sure to sign up for our newsletter for more Disneyland fun and backstage photos. Sign up here. If you enjoyed this article and have friends who would too, be sure to SHARE IT with them. Simply click the buttons on the left or below.